First-Year Seminar (FYS) is a foundational, workshop based course designed to provide on-going support and resources for students as they transition to post-secondary education and the WVNCC experience. It is intended to connect students to the college community, programs, faculty, staff, and peers. It provides an introduction to college expectations and emphasizes the knowledge, skills, and attitudes necessary for personal growth, college success and professional attainment. This course is specifically designed for first-time college students during the first semester of coursework. 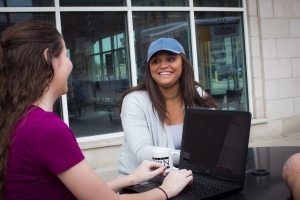 Through FYS, every new Northern student is paired with a MENTOR. MENTOR: A knowledgeable guide, thoughtful facilitator, reliable resource and trustworthy advocate. The mentor’s goal is to help each student transition to WVNCC and begin the academic journey on a sure foot. The mentor is available to clarify expectations, discuss possibilities, and reflect choices. What Do WVNCC Students Say About the FYS Experience? I couldn't have made it as far as I have this first year of college without the advice and help from my mentor, and I greatly appreciate everything she has done for me. ...they [workshops] were actually helpful. It wasn't useless information. I think the workshops were really helpful. They covered a lot of material that many students have issues with and they helped us get familiar with [...] our student portal and the other staff members. ...the workshops provided me with the knowledge to better organize and manage my life as a college student. FYS is designed as a workshop-based experience. Workshops are designed to include a variety of topics, methods and activities to keep students engaged, accommodate different learning styles and provide an informal, intensive, and participatory opportunity. Each workshop is "expertly" led by a key member of the WVNCC faculty/staff team. Do I have to take FYS if I took a COLL 101 course in high school? I'm transferring EDGE (college/dual) credits from high school, do I still have to take FYS? I'm transferring credits from another college to WVNCC, do I have to take FYS? I am not seeking a certificate or degree from WVNCC, I just want to take a couple of classes. Do I still need to take FYS? I'm a part-time student, but I am working toward a certificate or degree, do I have to take FYS? I didn't take FYS during the first semester, do I still have to take it? Yes. Immediately. ASAP. The sooner the better. I'm a non-traditional (older) student; this isn't my first rodeo. Do I still have to take FYS? If I don't pass FYS (which shows up as a grade of 'N'), do I have to take it again? Yes. If you want to graduate. Only if you make it hard. Good luck. Almost all institutions, (both 2 and 4 year) in the country, require some form of FYS. I have a question that isn't answered here, so I guess it's not often asked...who should I contact?